Summit Kilimanjaro on a cloudless full moon night is without a doubt an unforgettable experience. The glaciers glittering in the moonlight is absolutely stunning. For obvious reasons the moonlight will also make the final night climb on your summit night easier and most of the time it will be unnecessary to even switch on your head lamp. In actual fact, planning your summit attempt to coincide with the full moon dates mentioned below would enhance your whole trek up the mountain, offering some magnificent night views of Kibo from most of the overnight camps. 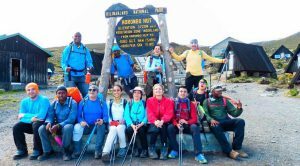 Any Group climbs can be tailored to be Kilimanjaro Charity Group Climbs. Please note the majority of group climbs do include acclimatisation day- which will help your success. Mountain Equipment such as walking poles, gaiters, hiking boots etc. Any items of a personal nature such as beverages, laundry, visas, insurance etc. Africa Joy Tours offers the best Tanzania lodge safaris we offer you a wide range of excellent Tanzania travel game lodges and tented camp accommodation to choose from. In Tanzania we can also offer you different standards and quality of Tanzania travel accommodation, each directly impacting on the total safari travel costs, but offering you the widest possible safari budget options. Standard game lodges: The standard game lodges resemble 3 star hotel accommodations. Some travel lodges feature swimming pools, a bar and all meals are served in restaurants. All rooms offer en-suite bathrooms and are air-conditioned and good value for money travel accommodation.